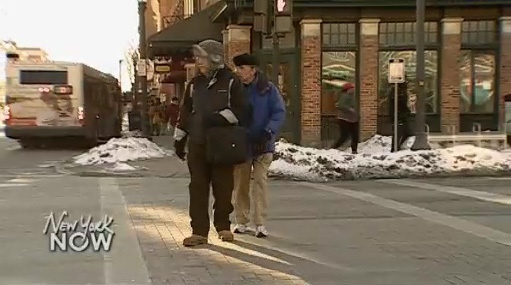 Complete streets legislation remains a top priority for street safety advocates in Albany, and PBS ran a nice feature last week on the issue. It starts at the 4:45 minute mark in this clip. On one side are advocates like AARP, who point to the fact that a motor vehicle driver kills a pedestrian on Long Island’s streets once a week and once every ten days in the five largest upstate counties. On the other, the New York State Association of Counties continues to make complaints about the legislation that mostly serve to show they haven’t read it. The poll is still open as of this afternoon if you’d like to cast your vote. I voted and it took twenty three seconds. I’d just like to say that complete-streets is more important to upstate than downstate. You mostly *have* sidewalks in New York; upstate, we have vast areas where it is manifestly unsafe to walk down the block to your neighbor’s house, due to roads with lots of car traffic, high speed limits, and *no sidewalks*.